I mentioned in the commentary for that story comic that there were a few images I probably spent too much time on. 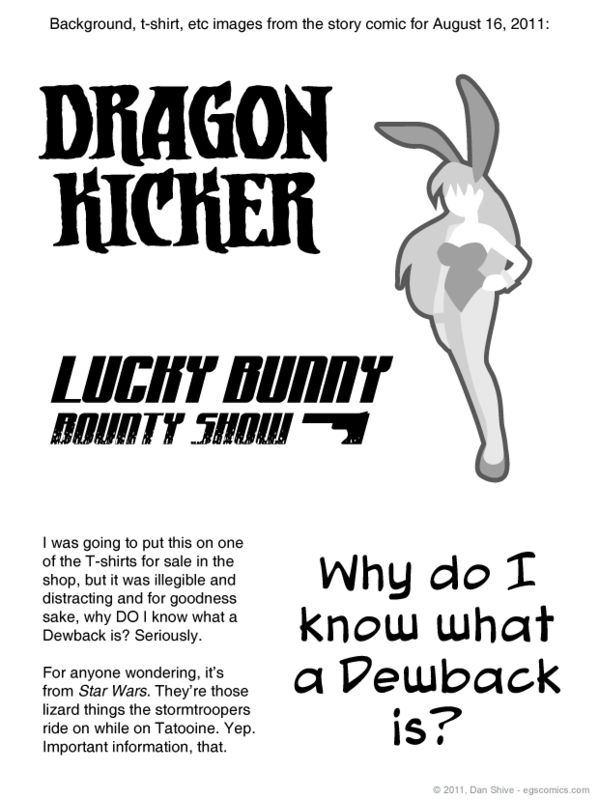 I consider "Dragon Kicker" an exception to that, as it was legible on Justin's shirt, but I wanted to incude a non-distorted version of it here, anyway. In spite of the view that it was overkill for that particular comic, I really would like to design simple, vectorized posters that I can reuse for background images. I really don't like just having blocks of color in place of something resembling an actual poster, but I don't want them to be too distracting, either. Some low contrast images could be nice to spruce things up a bit, and based on how long it took to make the bunny girl, they shouldn't be that difficult to make. The whole "why do I know what a Dewback is" thing is just one of those things that dawned on me one day. What use is this random trivia? Why do I remember this and not certain other things that would be of greater use to me? Why dewbacks, why?! They don't even call them dewbacks in the movie! At what point in the actual movie do they say the word "Ewok?" WHY DO I KNOW WHO WICKET IS? !